While South Africa possesses a baseball history that spans more than 100 years, the sport remains in the shadows of rugby, soccer and cricket. In fact, most South Africans are not aware that baseball is even played in their country. While the game is not widely played, the leagues are well organized and the players are competent. Baseball in South Africa is played under the direction of the South African Baseball Union and is played at the club level. These clubs clubs are affiliated to provincial/regional governing bodies. For example, in Cape Town, clubs are affiliated to the Baseball Association of the Western Province. South Africa has several baseball leagues located in all of the country’s provinces. Currently, the hot-spots in terms of baseball talent lie in the Eastern Cape region, Durban, Johannesburg and Cape Town. The top players in the Cape Town area play in the Western Province Major League. The league is a 10-team wooden bat league that has produced numerous players that have gone on to play professional baseball in the United States and Europe. 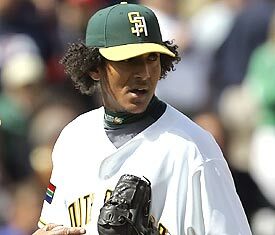 Additionally, more than three-quarters of the players from the South African National Team that competed in the 2009 World Baseball Classic were products of the Western Province Major League. Since the fall of the Apartheid government in 1994, the game has spread to other parts of the country including the nation’s capitol, Tshwane, (formerly known as Pretoria), Natal and many other areas, including rural Townships. Today, participation in adult and youth leagues is estimated at more than 250,000 players. (source) That’s about a third of what rugby claims. South Africa’s baseball breakthrough occurred when the national team qualified for the Olympics for the first time in 2000. With Australia getting an automatic Olympic berth as the host, South Africa had a golden opportunity to qualify. The team defeated Guam in the Oceania/Africa play-in tournament in a three-game sweep. In the Olympic Games themselves, the South African team went 1-6 and four of their six losses were via the mercy rule. However, their one victory was against the seasoned Dutch team, a country with much international experience. 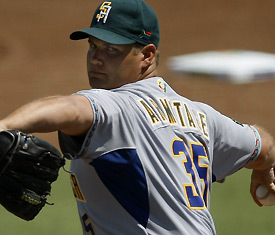 With Major League Baseball’s desire to grow the game in the African continent, South Africa was invited to the inaugural World Baseball Classic in 2006. Although the team was out-classed in the first round of play, the team did turn in an impressive performance against Team Canada. After Canada took an early 3-0 lead, South Africa came back to take a 4-3 lead in the bottom of the 5th inning. Canada scored four runs in the top of the 7th, highlighted by a Corey Koskie two-run home run to right field to help Canada take a temporary 7-4 lead. With the bases loaded, South African second baseman Paul Bell cleared the bases with a double down the left field line to put South Africa up 9-8 going into the 9th. Bell went 3-for-3 with a pair of doubles, one run, one walk and four RBI. Three outs away from pulling off the biggest upset of the World Baseball Classic, South Africa and its 17-year-old reliever Jared Elario couldn’t prevent a four-run, ninth inning rally from Canada, who had to look to its bench for a hero. After entering the game late as a defensive replacement, Ryan Radmanovich hit a 430-foot triple off the base of the wall in straight-away centre to lead-off the ninth inning for Canada. Radmanovich was cashed in by a double to right by Adam Stern to tie the game. Elario continued to struggle, throwing two wild pitches with Canadians on third base and giving up an RBI double to reserve outfielder Sebastien Boucher to run the final score out to 11-8. “We had to put a 17-year-old pitcher on the mound, and we just couldn’t get the three outs,” South African Manager Rick Magnante said. While the South African team came home winless after the 2006 World Baseball Classic, their effort was not wasted. Many players were signed to minor league contracts in the U.S. They include Carl Michaels (Milwaukee Brewers), Paul Bell (Brewers), Tyrone Lamont (Seattle Mariners), Nicholas Dempsey (Montreal Expos/Cleveland Indians), Brett Willemburg (Kansas City Royals), and Barry Armitage, who pitched for the Kansas City Royals AA affiliate in 2005 and 2006. To date a South African has yet to play in the Major Leagues. That fact may soon change as Major League Baseball continues to invest money into South African baseball programs. Since 2006, Major League Baseball has funded children’s programming, coaching assistance, and clinics to try to help South Africa’s development along. In addition, MLB has contributed to building a new national training center in Cape Town and upgrading four fields in Johannesburg. This should be a great help to the development of baseball in the country because games are mostly played on old overgrown cricket or rugby fields with no pitcher’s mounds and thick grass that slows ground balls. Team managers and coaches say this often puts infielders at a disadvantage in global competition, where they lack the quick reflexes that infielders from other countries have honed. Today, there are a record eight South African baseball players in the minor leagues: Tayler Scott, Kieran Lovegrove, Anthony Phillips, Hein Robb, Dylan Unsworth, Dylan De Meyer and Robert Lewis-Walker. While South Africa has yet to produce a Major League talent, their greatest hope lies in 22-year old Gift Ngoepe. The switch-hitting shortstop was actually born and raised on a makeshift baseball field just outside of Johannesburg and slept with his parents at night in the clubhouse. Ngoepe, now an infielder for the Pirates’ affiliate in the Florida State League, is one of and perhaps the best player in his country’s history. He had two consecutive triples vs. team Mexico in the 2009 World Baseball Classic. Like everything in South Africa, baseball was once segregated due to Apartheid. As recently as 2000, South Africa’s national team – the same team that played in the 2000 Sydney Olympic Summer Games – was all white. Today, more than 80% of the participants in youth leagues are black or coloured (what South Africans refer to mixed-race people as), a recent study found. (source) As a result, the country’s national baseball team is now among the most diverse of any in South Africa. While baseball’s progress has been great, for there to be a bona-fide Major-League-worthy talent developed here, baseball will need to develop a professional league within South Africa. Only then will there be incentive to draw the best athletes away from rugby, cricket and soccer. Paul Archey, MLB’s senior vice president for international business operations, says the recent development of South Africa’s elite program, which recruits and trains the country’s best players, compares favorably with that of Australia. That country, which had only three players in the U.S. minor leagues in the early ’90s, now has nearly 100 playing professionally in the U.S. and Canada. Over the past two decades, 23 Australians have advanced to the Major Leagues – helped in part by the establishment of the Australian Baseball League. South Africa, with more than twice as many people as Australia, thinks it can do better. South Africa will take on Israel in the first game of Qualifying Round 1 on Wednesday, September 19th at 7:00pm. South Africa has released it’s qualifying roster – complete with Twitter handles!